You don't have to have years of quilting experience to begin creating beautiful bed coverings. In fact, all you need to get started quilting is some fabric and supplies, a sewing machine, a little patience, and a bit of inspiration. Try one of these pretty (and easy) beginner's quilt patterns, perfect for learning this popular hobby. This quilt is a great project for you first endeavor. If you choose beautiful fabrics, you can create something lovely but very simple. The finished quilt will be perfect for a living room throw, about six feet long by four feet wide. Wash all the fabric together to make sure the colors don't run and that they shrink evenly, if any shrinkage occurs. Iron as needed. The most difficult part of this quilt is stacking the pieces properly. You'll want both fabrics to be right side out when you turn the piece, so stack your fabrics right-sides together with the batting at the bottom of the pile. Pin all around the edges to secure the layers together. Use your sewing machine to stitch a straight line about a quarter of an inch from the edge of the fabric. Sew the complete length of three sides and most of the length of the fourth, just like you would do if you were sewing a pillow. Turn the project inside out through the fourth open side. The printed sides of the fabric should be the front and back of your quilt, while the batting is all inside. Check to make sure that your stitching has gone through all the layers all the way around, and turn right side in and stitch again if necessary. Trim any excess fabric from the seams, turn right side out again and press, making sure the batting or muslin is uniformly flat throughout the quilt. Stitch the open part closed by hand, using a thread that matches the fabric and trying to make the stitches as invisible as possible. To quilt your project, measure even intervals along the top and bottom edge of the quilt. Use the dressmaker's pencil to draw straight lines from one edge to the other. These will be your guides for sewing. Beginning with the lines in the center of the quilt, use your sewing machine to topstitch along the pencil lines. Be sure to keep all the layers even and smooth as you work. When you finish topstitching the layers together, pat yourself on the back. You've just finished a quilt! A rag quilt is very simple to create, even if you're new to quilting. You can assemble this quilt a strip at a time and use your regular sewing machine to quilt it. You can get creative with your fabric choices too. 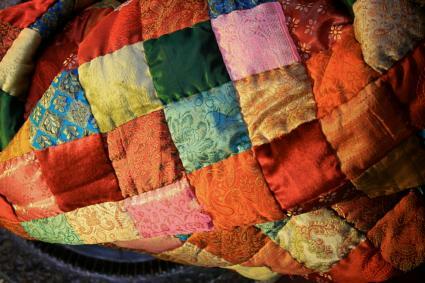 This is called a "rag quilt" because you can make it out of scraps like old clothes or cast-off linens. When you're done, you'll have created a treasure. One and a half yards of simple backing fabric. Use the cardboard pattern and dressmaker's pencil to draw squares onto the fabric. Cut out 64 squares from the fabric, mixing patterns as much as possible. Place two squares together, and sew a seam a quarter of an inch from the edge. Add another square and repeat. Stop when you've created a strip that's eight squares long. Create seven more strips the same way. When you have all your strips done, begin sewing them together. Iron the front of the quilt. Lay it out on the backing fabric, and cut the backing to the same size. Repeat with the batting. Stack all three layers together with the right sides in and the batting on the bottom. Sew around three sides of the quilt, leaving a quarter-inch seam allowance. Turn the quilt right side out, and sew up the fourth side by hand. 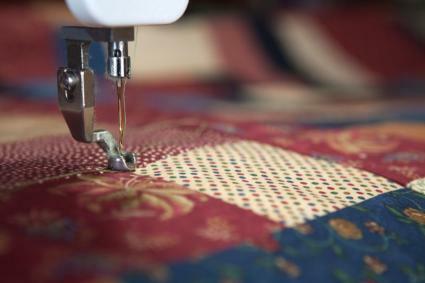 Use your sewing machine to sew a straight line over each seam on the front of the quilt, highlighting all the little squares. This is called "stitch in the ditch." 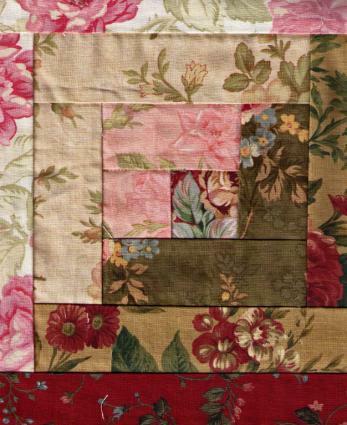 If you love floral fabric, you'll really enjoy creating this easy flower garden quilt. The entire design is based on using longer and longer strips of fabric to make the quilt front. Choose coordinating floral fabrics to create your "garden." You can make this quilt any size, but it's easier to start small if you're a beginner. 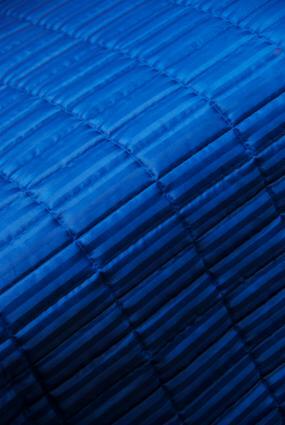 Begin by cutting your fabric into long strips, each three inches wide. Cut all the floral fabric into these strips and sort them by pattern. Choose one strip, and cut a piece off of it that is three inches long. This will be a small square. Cut another piece out of the same fabric that is five and a half inches long. Cut a three-inch square out of another fabric. You'll have two small squares and one small rectangle. Sew the two squares together, using a quarter-inch seam allowance. Together, they should be the same length (five and a half inches) as the rectangle you cut out. Next, sew the rectangle to the two small squares, creating a larger square. Select another strip in a different pattern, and cut a piece five and a half inches long. Cut another piece eight inches long. Sew the smaller piece to the square you made in step four, creating a rectangle. Sew the longer piece to the long side of the rectangle, bringing the overall shape back to a square. Continue cutting and adding pieces in this way until you've created a quilt front of the size you have in mind. When you've finished piecing the front, iron it to make it flat. Cut the batting and backing to match the size and shape of the front. Stack all three together with the backing on the bottom and the two fabric layers together with their right sides in. Leaving a quarter-inch seam allowance, sew a seam all the way around three sides of the quilt. Turn the quilt right side out and sew up the fourth side by hand. Spread the quilt out and begin tying it. To do this, you'll thread your embroidery needle with floss and take a stitch down from the top of the quilt, through all the layers, and then back up to the top again. Tie a secure knot in the floss on the top of the quilt, and cut the ends to one inch. Repeat all over the quilt, placing tied spots at the places where fabric corners meet. Keep it simple and small. Pillowcases, place mats, and baby quilts are easier to maneuver when you are first learning to quilt. Forego using templates. They will only complicate what you are trying to learn. Stick to simple patterns that use all of the same or similar size blocks or strips of fabric. Don't use heavy batting. It will much harder to cut and quilt. Use 100 percent cotton fabric or fabric that has been pre-washed. Cotton doesn't pucker and is easy to work with. It also comes in a variety of styles, colors, and designs. Be consistent with seams. Don't change your seam allowance half-way through a project. Find one you are comfortable with and use it consistently. A quarter of an inch is a good choice most of the time. One of the most important things to keep in mind when you're learning to quilt is that this is a skill that takes practice. Start with a project that's manageable, and be patient with yourself as you learn. Soon you'll be turning out masterpieces to decorate your home and give as gifts to friends.